A group of local boys, members of what is known as a coffee pot band, are now touring the state and playing at various theatres. The boys are styled as the "Percolatin' Puppies," by their management. They sing, dance, joke, and play on their unique instruments. They have been well received by audiences throughout the state. 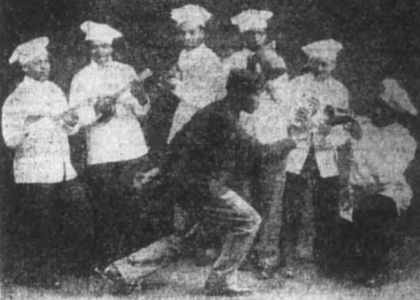 They were employed by Jack Dempsey, at his camp when he was in training to fight Tunney, the last time. The four Riff Brotherswho really aren't brothers at all, are Naptown's [Indianapolis] most bizarre gift to radio entertainment. Here they are, folks, as you know them. 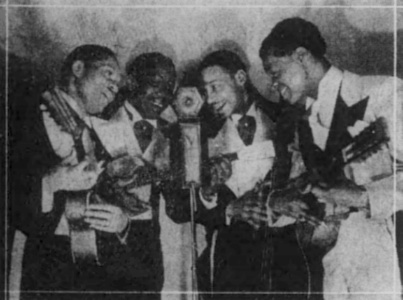 Melvin Campbell, Ivory Watson, Arville [Orville] Jones, and the inimitable, former Indiana Ballroom eccentricity, "Simp Green" Elmer Olliver. They're burning 'em up every night over WLW. And you know how!